Its been around three years since the last blog posting and man, a lot has happened! I found the Flying Monks Tri Club (Malmesbury, Wiltshire) as an outlet to channel any spare energy that might be left over after the kids have worn me out; nothing too serious but it has been a great find which has allowed me to revert back to my roots and pick up my swimming. To date, and quickly nearing the ripe old age of 40 (!) I am swimming faster than I was 'in my prime' in my late teens living back home in Cornwall. The 'Monks' are a great bunch and it enables me to keep my base fitness to a level I am content with until the kids are old enough such that I will be able to focus more time to training. Ellen has been my heart and soul as always, forever at my side through the ups and downs that life has thrown at us. The biggest hurdle to date has been the loss of our baby boy Joshua back in 2013, which was also compounded by the calamitous liquidation of our contractor whilst building our own house; money we will never get back! Running has ticked over gently with lots of half marathons par for the course, and a sub-20 minute 5km PB well earned. The main event came at the end of 2015 with a return to Cornwall on the Atlantic Coast Challenge, and challenge it certainly ended up being! Not enough training by far (kids and life), coupled with a bad tear of the adductor muscle a week before the start made the journey slow and extremely painful; much slower than the previous years by far. In a strange way though, I really enjoyed it. I ran it solo for the first time which was great, although company at times would have been welcome, as it made it quite a lonely journey at times. Just proof that 82 miles in a weekend is not something to head into on a whim, which is effectively what I did. Recovery took a while, but I'm now at full(ish) fitness ready to go again in October this year!! Next up, Royal Wooton Bassett Sprint Tri mid May. We feel so, so blessed to have experienced such a precious, short, but sweet time with our boy. Looking forward to an injury free year and the running's been good so far, although the few added pounds of Christmas food is taking some shifting! The end of 2012 didn't turn out quite as planned. I had organised for me and a couple of friends to take on the Three Peaks Challenge back on the 26th October. For those unfamiliar with the challenge it involves conquering the the three highest mountains in Scotland (Ben Nevis), England (Scafell Pike) and Wales (Snowdon) including the travel betyween, within 24 hours. Unfortunately, on the week leading up to the challenge the weather took it's toll and -18C (i.e. -0.5F) blizzard conditions were forecast for Ben Nevis. The concensus was to postpone until Easter 2013; so another date in the diary to look forward to! A major target for me for 2013 is to get back to training for a road marathon. Away from the trails I know, but something I just need to get done. My last road marathon was way back in 2010 when my wife, Ellen, and I went for a long weekend in Paris. In short, a fantastic weekend, great course and weather but severly hampered by gastric flu, so I ended up walking the majority in a daze. I've vowed to return ever since!. This may be the year we go back, however, £ is in short supply and Paris is therefore dependent upon the sale of our house. I may end up going more locally and saving Paris for another year. 2013 is choc full of great races, with friends (and fellow bloggers) lucky enough to get into some top events. 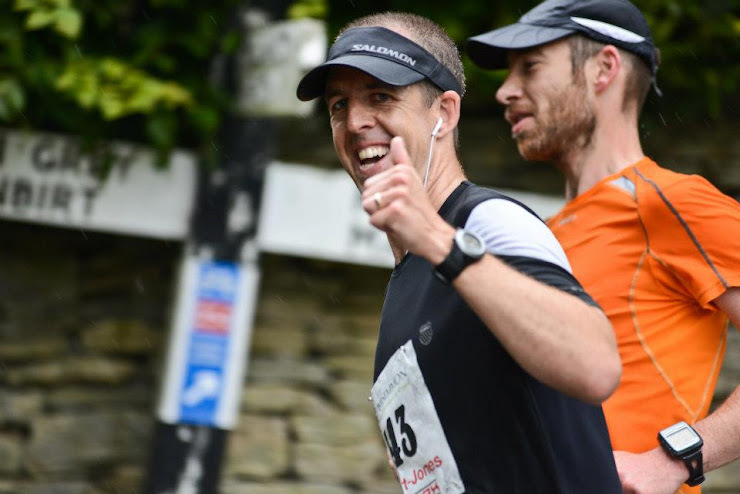 Top of the crop has to be Ultra Disco Stu who has a big summer of the Lakeland 100, UTMB and unbelievably Western States to sink his pumps into!! My major goal this year is a charity event that has been developing away in the depths of my mind. In it's planning infancy at the moment, but the idea is to run 13 half marathons in 13 consecutive days. More details to follow over the coming months. Finally, 2013 is already turning out to be a special year; my wife has once more bid adieu to her toes and will see them again in mid-July, meanwhile baking away with our FOURTH baby!! Remember, Running=the real sport. The others just play with their balls. Well, folks it's been a very long time out but things are finally looking up. As a brief re-cap, I went out on a usual Sunday morning run back November 2010, waiting most of the morning for the sun to melt the early morning ice. Unfortunately, over I went on a patch of black ice and hyper-extended my right knee. After being given the run-around by numerous physio's and doctors, I eventually got referred to a knee specialist/consultant and finally went under the knife in November 2011, a full year out of the trainers with a still to be diagnosed problem. Torn cartilage and plica syndrome (see previous post) was the damage. 10 weeks of physio followed but I eventually got very disheartened by the apparent lack of enthusiasm given, so finished it and resolved Googling recovery programs of people who had been through similar situations. Now, September 2012, I am pleased to announce that I am back; having only two days ago completed my first race since injury - the inaugural Malmesbury Half Marathon. It provided a great opportunity as a come-back race to run in my town. Lots of people that I know within the town, plus one or two that I had met further afield (including at the Atlantic Coast Challenge) made for a great, if very, very wet, event. The main aim of the run was to check the strength of my knee over the distance. I had only run one 10 miler and one 13 miler in the lead-up to the race, so running fitness was a complete unknown. I had been a bit of a slave to the gym in the time spent away from running, both in terms of strength and cardio work, so I was hoping that this would at least see me through the first 10 miles. I had planned to average out 8:30 minute miles just to see how things went, however when we started off I just felt great and decided to go with it, hovering around the 8 minute mile mark. As it panned out, I finished in 01:46:41 averaging out 8:09 per mile – only around 5 minutes off my PB of 2 years ago in Chippenham! Anyway, I’ve been really enjoying reading all the blogs and the adventures that people have been getting up to so it’s about time I started enjoying myself once more. First up, on the weekend of 26th October is the Three Peaks Challenge – 24hrs to include Ben Nevis, Scafell Pike and Snowdon. Roll on 2012, the quicker I can escape the disapointment of 2011 the better. Happy Crimbo and see you on the trails in 2012!! Arthroscopy booked for the 30th November, let's hope they find something! Physio failure and referred back to the consultant....'nuff said! !